Completing your book is a euphoric feeling. It feels good to see months of writing and re-writing finally set into place as one complete novel. Hold your horses though, as there is still one herculean task left. Yes, we’re talking about that seemingly complex task of formatting a book which is making the elements in your novel flow together in an aesthetically pleasing way, so readers can get a comfortable reading experience. At first, formatting can be quite tedious, but if you take your time to understand the use of every formatting tool at your disposal, the process becomes quite fun. Of course, you don’t have to stress yourself out with super-extensive formatting; approaching a well-known self-publishing house for the extra effort will be best. But, to understand the mumbo-jumbo of book formatting, read on for the tips and tricks to follow while formatting your work. If you have various parts of your novel spread across multiple word docs, the first thing to do is to put everything together in one document. Click on the “Page Layout” tab in the doc. This tab is where you can edit the margins and page size of your novel. The default page size is A4 on MS Word, but your book may require a different size and width depending on the genre or audience you are writing for. Let’s assume you are planning to publish a standard paperback. The recommended size is 5.25 inches width x 8.25 inches height. 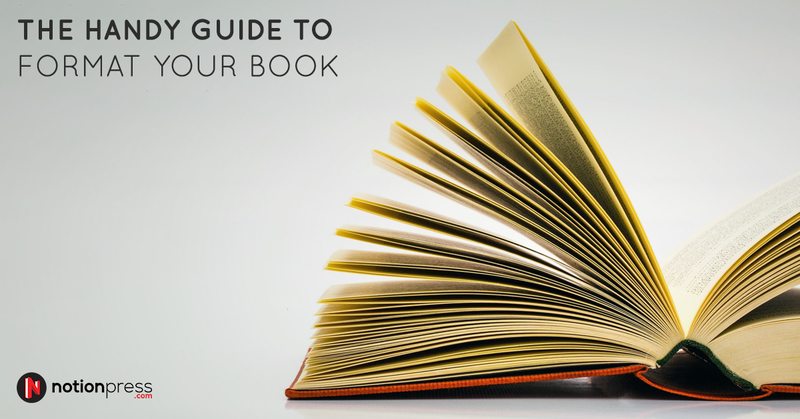 Margins must be customised based on the number of pages of your book. If you have more than 200 pages, keep your margin width and height over 0.5 inches. Margins play the double role of enhancing readability and guiding bookbinders when the cover has to be attached. Once you’re done setting up the pages, it’s time to move on to the most crucial element of your book – the words. Formatting this is all about making sure your text is very legible. Keep fancy fonts and bold letters for your chapter naming, but for the main texts, opt for serif and sans-serif fonts. Serif fonts are best used for books that are published as physical novels. The best, most readable serif fonts are Baskerville, Caslon and Century Schoolbook. Sans-serif fonts are eBook friendly, and the best include Arial, Optima and Verdana. For optimum readability, keep your font size at 12 points. It is ideal to keep single line spacing, especially if your novel’s genre caters to a mass audience. For children’s books, double line spacing works best. Whatever be the spacing, format your lines and paragraphs in such a way that you will have an average of 12 words per line. For the best visual appeal, format the entire text to “justified” alignment. Make it a habit of starting new chapters on a fresh page. It is advisable to start new chapters on odd numbered pages. Doing so keeps the chapter on the right-hand-side of your book. Also, to make your book look neat and clean, you can opt for part pages to mark the beginning of every new chapter. For visual appeal, try out some fancy bold fonts and keep your typeface as all-caps. You can also add icons relating to the chapter’s title if you are writing for children. Pictures can greatly boost your book’s visual appeal, as well as keep readers engrossed. Using illustrations inside your book is best when you are writing a children’s novel. MS Word may not be the best tool for formatting illustrations, but you can always take the help of our recommended top ten design resources for authors, for some great assistance. The above steps are as far as MS Word can help in formatting, but if you are writing for a niche audience or preparing a heavy-set book, you can always try using various other editing and formatting tools. Here are some of the best tools you can use, categorised based on their various uses. Google Docs works very similar to MS Word and gives you a bunch of added perks like auto saving, cloud storage, edit-anywhere feature, doc sharing and access to a multitude of writing templates. The best part of this tool is that it is free to use. Bibisco is one of the most comprehensive free writing tools that give writers a way to individually organise various elements of their novel, perfect it and then put it all back together in one finished piece of work. For the writers who crave an extra dose of professionalism, Final Draft offers industry-standard script and screenwriting options. Apart from a nifty auto-formatting tool, there is a package extension that lets you develop key plot-points while writing a story. Evernote is a paid cross-platform application that lets you take and share notes. The notes can be of any form, from hand-written to voice memos. Evernote is a handy tool to use if you have a very long piece of work and require a quick way to get around the write-up without getting lost among the numerous pages. A subscription-based mobile app, Freedly lets you put all your content in one place, irrespective of the file format. It also allows you to secure all the files that have confidential content. You can also share files and download more tools if you need to collaborate with other writers. Grammarly is one of the best tools to use when you need to quickly proof check your work. It can scan and correct over 250 types of grammar mistakes as well as contextual errors. You can use the free tool, for simple grammar editing or subscribe to open a plethora of grammar checking options. Plagiarism is a dangerous thing, especially if you are writing a commercial piece like a novel. To stay on the safe side, put your content through Copyscape to check for plagiarism of single sentences and entire paragraphs. You can choose to use this tool for free, but the paid version gives you guarantee that your content is original. Formatting a manuscript takes it a step closer to the finish line of a complete novel. Whatever you choose to format in your book, make sure to be consistent in your approach and re-read your effort. Want to be a perfectionist? Check out these editing tips that can make you a better writer. Approach Notion Press for a hassle-free publishing experience and help us help you make your novel an International bestseller. Completing your book is a euphoric feeling. It feels good to see months of writing and re-writing finally set into place as one complete novel. Hold your horses though, as there is still one important task left – the herculean task of formatting your book. Yes, we’re talking about that seemingly complex task of making the elements in your novel flow together in an aesthetically pleasing way, so readers can get a comfortable reading experiencing. Evernote is a paid cross-platform application that lets you take and share notes. The notes can be of any from, from hand-written to voice memos. Evernote is a handy tool to use if you have a very long piece of work and require a quick way to get around the write-up without getting lost among the numerous pages.